Welcome to part two of our look back on SparkFun's 2012 East Coast tour! If you missed the first installment, you can check it out here. Onward! After spending the weekend in Boston, Linz and I jumped on the Mass Pike and headed to the Five College area. Our first stop would be UMass Amherst for a workshop at the M5 lab. They are a fantastic resources for students and a university with a dedicated MakerSpace that's pretty hip. From UMass it was on to Hampshire College, a liberal arts school known for breaking the mold in many ways. The Lemelson Center at Hampshire hosted us for an Arduino workshop with a wide variety of attendees. The inclusion of E-textile and embedded computation has really shown how far an iconoclast like Hampshire can go to work with its students in areas around new technology. While we were there we saw some great projects, including a 555-powered musical glove. From the Five College area we were off to New York City. Linz had been working up a presentation on open education practices and it was time for him to deliver it to a group at the Tisch School's Interactive Telecommunications Program (ITP). Many of you will have heard of ITP, but for those who haven't, it's a hub for technology and social interaction of the first order. Many of the names that we are familiar with around embedded computing and design environments are connected with ITP. We ended up with a lively discussion with the staff and students at ITP about the state of education, and how to best handle the material and its dissemination around what has become a driving force for the people in the room. We bantered back and forth about the roles of vendors, educators, students and communities in an open-source model that supports a broad base of learning in the 21st century. The next morning we awoke and headed to the classroom of Gerald Ardito, an educator we had met the year before at MakerFaire New York (I recommend Gerald's blog about education). Gerald had spent the intervening year implementing Arduino at Pierre Van Cortlandt Middle School in Croton-on-Hudson. We were bowled over by how well Gerald's students were able to work with Arduino and how early adoption of this technology in a middle-school setting was going so well. We spent the morning and afternoon with Gerald's students and did some programming and circuit building. Gerald's students were a delight and we can't wait to go back and see what they all cook up in another year. Stay tuned for the final leg of our East Coast tour recap soon! Awesome to see you guys going everywhere! On a side note. Everyone wish Josh Ashby, the IT Intern (#lameintern tag on Twitter) good luck as he goes to college. 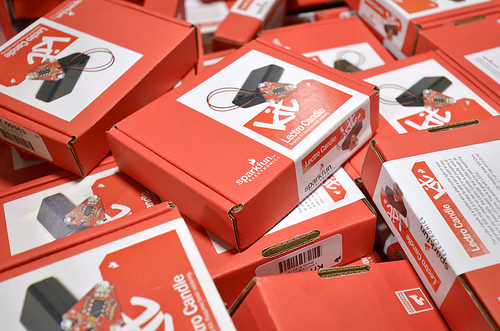 SparkFun has already come to Columbia twice, in May and in August. We'll announce on http://open-it-lab.com/ when their next visit is scheduled.